Skunks are one of the most popular species of wildlife that we are called upon to control in Kentucky. Skunks can be found living in crawlspaces, under front and rear porch and patio and basements in homes and businesses throughout Kentucky. They also take up residence under sheds, in hot tubs and outbuildings. A shed is normally elevated off the ground and is perfect for raising a family. If there is shelter they will seek it! Skunk control and removal should only be attempted by people who understand the danger this animal can present. Wildlife Professionals understand this danger and have the tools and training to safely handle these very strong animals. Kentucky Animal Removal is your local professional that can get rid of your Skunk. Skunks living in a crawlspace will defecate and urinate and contaminate the insulation and soil. These droppings should be removed to control diseases. To control pest Skunks, we often must begin Skunk trapping. Trapping Skunks is necessary in most cases. We know how to get rid of a Skunk and have years of experience of removing Skunks. Skunk pest control is one of our specialties at Kentucky Animal Removal. Trapping a Skunk humanely is important to prevent injury to the Skunk. Getting rid of a Skunk is a process that should be carried out with proper planning and procedures. Skunks removal can be done in an efficient manner with the proper tools and training. If I had a Skunk in my home, I would want a professional that could remove the Skunks under the porch quickly and humanely. Skunks will dig for grubs, a process called “grubbing” in lawns and landscapes. Grubs are a great source of protein for skunks. 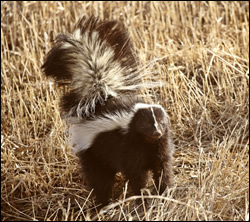 Skunks also carry rabies, distemper and mange. These diseases can be transmitted to humans and to your pets. Make sure your pets have been vaccinated against these harmful and fatal diseases. A dead Skunk in your porch, patio or crawlspace is a service that we provide including the deodorization of the area in Kentucky. Skunks do occasionally die in unusual places and they must be removed as soon as possible. We have even found a dead Skunk in a wall. Leaving the Skunk will only make the problem worse and cause further damage to your home and attract other animals and insects. Animal control for Skunk is a necessary service to protect your home and family. Removing the skunk is the first step to making your home healthy again. Get rid of skunks the right way before the problem gets out of control. Raccoons and Skunks are part of the Rabies Vector Species and all state laws and procedures are followed.